The Age of the Church is the communal testament of two men facing the end of an era. The first two volumes contain essays that span the history of the church, but the book is more than a collection of essays. Rosenstock-Huessy’s colleague at the University of Breslau, the church historian Joseph Wittig, had been attacked as “Luther redivivus“ for his statements of doctrine in essays written for what he saw as a Catholic people living in fear of its own Church; he was eventually excommunicated. (The ban was lifted unconditionally twenty years later.) The third volume is a detailed documentary record of the events leading up to Wittig’s excommunication. That description fits the authors themselves: Wittig “kept order on the inside,” first by demonstrating how doctrine sprang from and was revealed by truths discernible in everyday experiences, and then by remaining steadfastly Catholic in the face of general condemnation; Rosenstock-Huessy’s works record the progress of the Spirit through time an ordering of time to permit free growth into the future. Rosenstock-Huessy’s first great vision at Verdun saw the millennium of European history as a whole. 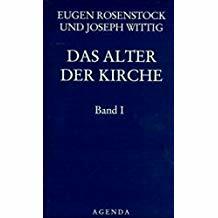 His work with Wittig widened that span to two millennia, and lays out the unity of the times from Golgotha to the present. involved used or remaindered books, but these may be less expensive.